The tug John Gregory (US No. 76025) was an extremely active vessel. She was inspected by Inspector Hughes in mid July 1878 and was launched shortly afterwards. The boat had an original cost of $15,000 for Green Bay’s Joseph Briquelot. He named the boat as a compliment to the designer and builder. 18 September 1878 – Captain Gorman says the new John Gregory is one of the smoothest running tugs he ever has handled. This was probably due to the fact that a Sheriffs wheel was installed. The Sheriffs propeller wheel for steam vessels of every class, which had become widely known, was used very extensively on the lakes, in New Orleans and on the Pacific coast. They made shipments to almost every part of the world. Vessels equipped with this wheel are conceded to be superior to all others for speed and other desirable attainments, and their popularity has been acquired by the universal success which has attended their use. The tug was sold to G.O. Spear on 10 Jan 1880 at a cost of $7,500. It was the new owner’s intention to use the John Gregory to tow lumber barges between Sturgeon Bay and Chicago. The newspaper Buffalo Express asked the question as to whether the new John Gregory was more powerful than the William R. Crowell (US No. 80531). The owners of both vessels agreed to test the strength of their boats at 2 o’clock on 17 Oct 1879. 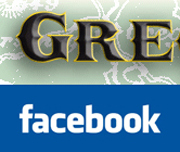 Although the Gregory was a little larger than the Crowell, the owner of the latter had every confidence of outpulling the other. In the spring of 1881, the John Gregory was the first ship to break the ice in the Sturgeon Bay for the season. The ship succeeded in breaking ice that was 15 to 20 inches thick between Seibold & Co.’s wharf to the canal cut. April 1882 – The schooners Bertha Barnes (US No. 2935), Oliver Culver (US No. 18891) and Mary E. Perew (US No. 16325) passed through Door County in tow of John Gregory. A highly publicized six mile race took place on 17 June 1882 between two tugs – the John Gregory and the O. B. Green. According to the Milwaukee Journal, both tugs strained themselves and they ran so evenly that neither craft could claim a victory. Except John Gregory, who built both of them. The race was the principal subject of conversation for weeks. In June of 1882, the John Gregory was fitted with a new Sherrifs wheel. This equipment upgrade enabled her to travel as fast as sixteen miles per hour and made her one of the finest and most powerful tugs on the Great Lakes. 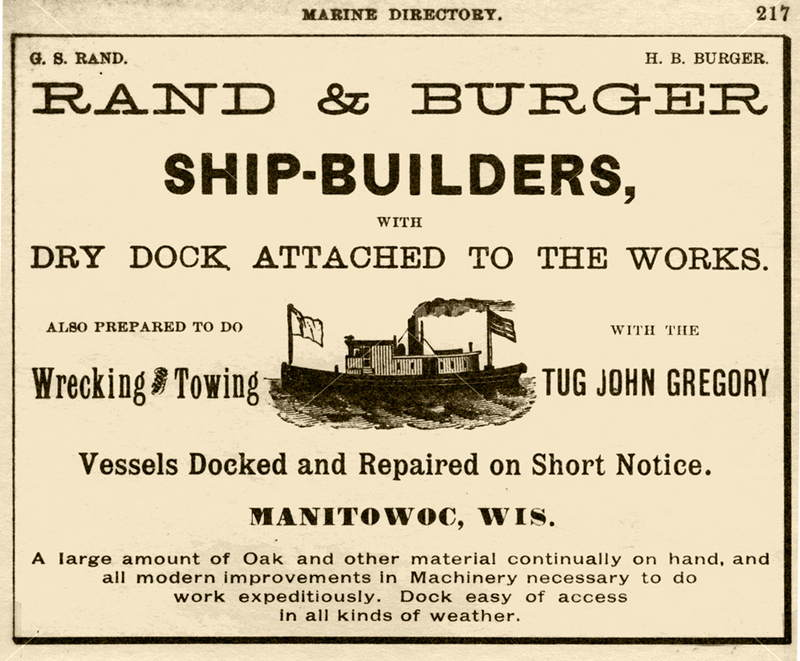 George O. Spears sold the John Gregory for $6,000 to Manitowoc shipbuilders Rand & Burger (today known as Burger Boats). They used the John Gregory to bring in profitable repair vessels. The boat was delivered to Manitowoc on 15 August 1883. Captain John Stubbs, formerly of the tug Brockaway took command of the John Gregory on 13 September 1884. Tug John Gregory, of Frankfort, was sold to George Anderson and others of Cleveland for $9,000 in May of 1887. She received a new wheel, repairs to boiler, and painted white with green bottom instead of black, her former color. She was a powerful puller having the engine of the old propeller Union (US No. 25048), a well known boat, wrecked off Marquette, Lake Superior, many years ago. The $100,000 steamer ship D. C. Whitney (US No. 157075) on her way from Ashland to Cleveland in August of 1887, lost course during a storm and crashed along the rocks of Hardwood Point about one mile from Port Hope. The life saving crew aboard the tug John Gregory saved the crew and was able to tow the Ashland (US No. 106412) back which was being towed by the Whitney. In the spring of 1888 Captain Adelbert J. Moffett, one of the best known and most capable tug men on the Great Lakes, was made master of the John Gregory, which he sailed for three seasons. That following September, during a competition between a rival tug line in rescuing a vessel, the John Gregory collided with the Forest City (US No. 9914) and a hole was knocked in the latter’s hull. Her crew boarded the John Gregory and the ship Forest City sank six miles from shore in nine fathoms of water. In March, 1899, the Sheriffs Manufacturing company Milwaukee, Wis., received an order for an 8 foot Sheriff wheel to be fitted into the tug John Gregory. 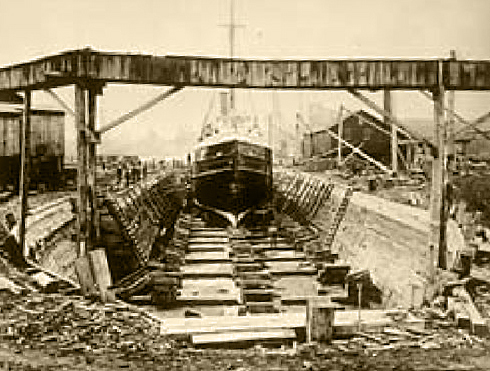 The John Gregory capsized during a storm on the night of 13 November 1904 at the mouth of the Cuyahoga River, about one-quarter of a mile NW of the Cleveland Station. Winds reached as high as 60 miles per hour. The master, Captain Dell Minney, drowned. She had a crew of six, of the three were on board, two were rescued by the life saving crew after a hard battle with the waves.